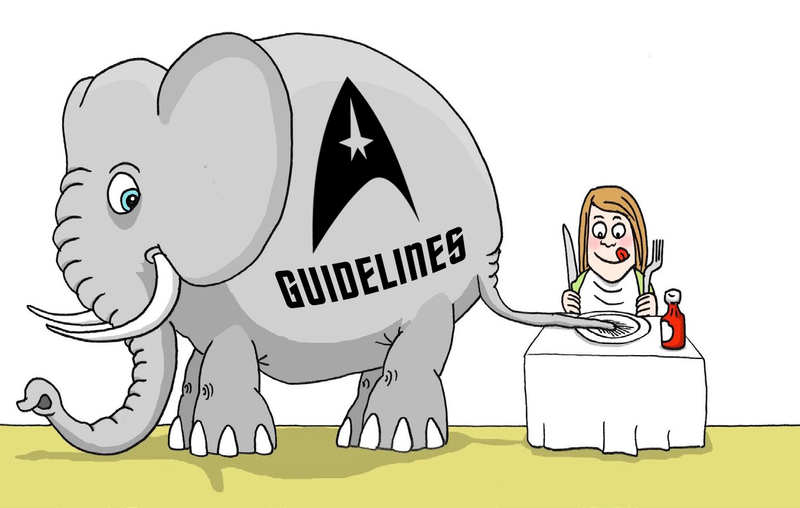 FAN FILM GUIDELINES: Reality Check (Part 7) – Eating the Elephant! In the previous entry of this blog series, I shared my thoughts on how to proceed with the SMALL ACCESS protest campaign. 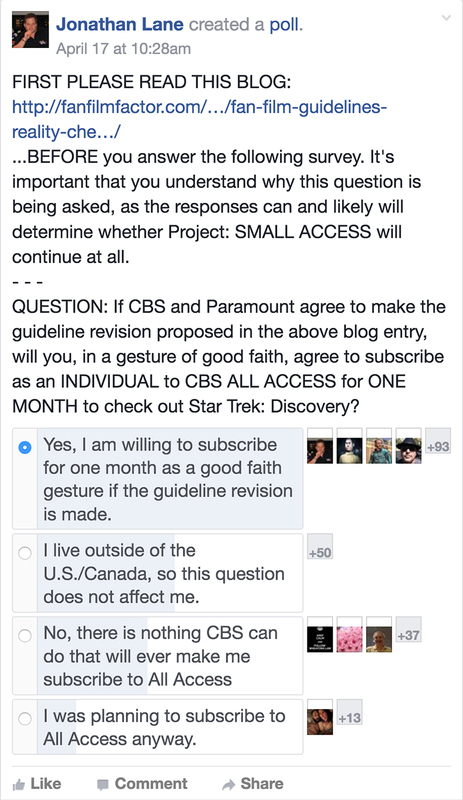 I created the Small Access Facebook-based group to try to put pressure on CBS and Paramount to revise some or all of the fan film guidelines by having our members pledge to watch the new Star Trek: Discovery TV series on All Access only in groups (with a single designated subscriber hosting viewing parties) rather than subscribing as individuals. This would be a potential revenue hit to CBS and a way to (hopefully) get them to take notice of our protest. Our first attempt at convincing the studios to revise the guidelines culminated in a letter-writing campaign that met with no discernible success. One of the challenges we faced—along with our unfortunately small size—was the fact that CBS and Paramount worked very hard writing these guidelines. The people involved had to get approvals and sign-offs from numerous stakeholders at higher levels. And so, convincing the studio executives to make significant changes to the guidelines now requires them to go back through that same time-consuming review and approval process. And spoiler alert: it also means they have to explain to their bosses that they screwed up writing the guidelines in the first place! To be honest (and realistic), I doubt that 1,300 irate Trekkies are going to be much of an incentive to get them to do that. So I realized, sadly, that a wide-ranging change to all or even most of the guidelines wasn’t a realistic goal. It was just too much of an uphill climb, no matter how passionately some might feel about the righteousness of our “noble” cause. 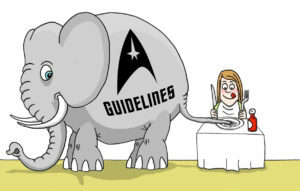 To the studios, the guidelines are now written in stone….and it’s a BIG stone…elephant-sized, in fact! But it’s said that if you want to eat an entire elephant, you need to do it one bite at a time. Could this be a viable strategy with the guidelines? Could we start with just one bite and work our way forward from there…? That one small bite, in my mind, would be going to the studios with a request to change just ONE guideline rather than all or even most of them all at once. A small change is much easier to get approved by the higher-ups and takes a lot less explaining. My hope was that this would be a starting point, a way to begin a conversation about how the guidelines were working and not working. And if we could get CBS and Paramount to consider revising just one, then perhaps others could be discussed, as well…once we were able to open a reasonable dialog. We just needed to take that first bite! Based on votes that the Small Access members cast in an earlier online Facebook poll, we determined that the most problematic of the guidelines was the “no ongoing series” portion of the first guideline. Members didn’t like the 15-minute limit or the “no professionals or anyone who previously worked on Star Trek” rules either, but the “no ongoing series” was the top vote-getter. The fan production must be less than 15 minutes for a single self-contained story, or no more than 2 segments, episodes or parts, not to exceed 30 minutes total. The production can continue featuring the same title, characters, and settings for additional episodes as long as no single story extends beyond two consecutive segments, episodes or parts. The first sentence is the same as before, but the second sentence is changed to allow for continuing series. (They simply can’t have a main story line continue for more than 30 minutes total.) 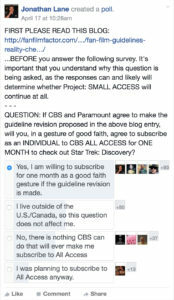 It’s a small change that honors CBS/Paramount’s concern that a 2-hour fan film could simply be split into eight 15-minute parts and skirt the intention of the guidelines. But in order for this suggestion to actually go anywhere, the members of the Small Access campaign had to do something that many of them weren’t gonna like: they were going to have to subscribe to All Access! (Insert ominous music here). I called it the carrot and the stick. The stick was, obviously, the sting of losing subscriptions to All Access at a time when CBS was desperate to give a boost to their fledgling online streaming service that was intended to go head-to-head with the likes of Netflix and Hulu and Amazon Prime. But CBS hoped that Star Trek, a major property with an established loyal following, was certain to bring in a lot of new subscribers. And the Small Access campaign would potentially shrink those crucial subscription numbers enough to worry the studios. But that stick also required a carrot. What I assumed everyone in the protest group realized was that, if we got our way, then we would have to hold up our end of the bargain and subscribe as individuals. That was our “offer” if they agreed to make some changes. And hey, if we only asked for one small revision to ONE guideline and they agreed, then the least we could do would be to all offer to subscribe for ONE month to check out Discovery. And if they wanted to revise more guidelines, we’d subscribe for more months. Unfortunately, Small Access has recently seen an increase in member posts bashing Discovery. And to be fair, the new series does seem to be having its struggles, and fans have found a lot to kvetch about. But with so much negativity, pessimism, and anger, a fair number of our members were planning to simply boycott the series completely…never mind the “watch in groups at viewing parties” idea. And I feared, with these “no way, no how” members, there went my carrot! So what do these results tell us about the viability of of the Small Access campaign? Is there any hope at all to fight the guidelines and try to change them? Or is this the final nail in the coffin of Project: SMALL ACCESS??? Tune in next time for the conclusion! Jonathan I’ve written my own explanation on these matters concerning the Future of Small Access. I’m one of those individuals that are taking the metaphorical carrot away. I continue to stand by that perspective. That’s a position I’ve held since the inception of Star Trek Enterprise in 2001. As a Fan Base…Trekkies need to demand better. We’ve tried desperation time, and time again and with astounding consistency Star Trek Executives have said undeniably “You are not important”. And with less than 1,200 active members of Project Small Access that is simply never going to change if you stay this course. Thus, as I’ve said before, the only logical way forward is to grow the movement. That’s the only thing you haven’t done and focused on since since before the member ship plateaued. Use the same demographic studies CBS/Paramount uses to direct their content. That subset of data is extremely useful. There are at least Twenty-three million Trekkies in America alone. 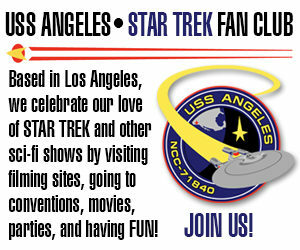 We have 1,288 of them, have you taken our case to Star Trek Forums and Boards? ST Excalibur, Bridge Commander Central, Star Trek Online Forums, Trek BBS, Sci Forum, Trek United, Star Trek.com and many many others? Have you establish a presence on You Tube where the have over a Billion users an over a third of the Internet’s population? Frankly there is so much meat left on the table for consumption and so many avenues to take that I’m truly astounded that at this point you for some reason believe this project is running it’s final course. On the contrary, it’s only just beginning. The real mistake of Project Small Access is that it’s remained a small project. One other thing that matters I think very much is time/timing. When someone does something it’s fresh in the mind with strong motivation still present. Over time people forget, reorganizations happen and so forth. We used to joke that corporations resemble a pendulum and as ‘each solution creates and equal and opposite problem’ unfolds, the new people undo what the last group did seeing clearly the problems the old solution created. So I suspect that after a few years when corporate trek as failed miserably and been abandoned, a new group of executives might be amenable to efforts to ‘revive the franchise’. The sole exception is if someone challenges what I call the slavery clause (no appearing in fan productions) in court. That one would, I sincerely hope, get tossed for what it is. What you call the “slavery clause” won’t/can’t be challenged in court unless CBS/P first sue a fan production and they argue that it’s a breach of contract (not infringement) action, and that, therefore, Guideline #5 is void in California. But it’s not possible for someone to simply go into court and have Guideline #5 ruled unenforceable. The law doesn’t work like that. More likely, there might come a time when the Screen Actors Guild (SAG) challenges the guideline and pressures the studios to remove it. In that case, it won’t be legal action so much as pressure from a powerful union. Let’s assume that everyone who responded to the poll, gets on board with your suggestion. I’ll wager Leslie Moonves spends more than that on lunch! Add two or three zeros to that and you might get CBS’s attention. Previous Previous post: AXANAR SETS get a CORPORATE SPONSOR… and a NAME for their NEW STUDIO!!! Next Next post: AKIRA YOSHIMURA reprises his role as SULU on SATURDAY NIGHT LIVE…41 years later!